The mission of the Teacup Dogs Agility Association has ever been to create challenges for the small dog that are comparable to the challenges presented for big dogs in other venues. The emerging challenges from international style of play are gradually being insinuated into TDAA coursework. This is intended as a primer for the design of those international-style challenges, with a nod to existing course design guidelines. 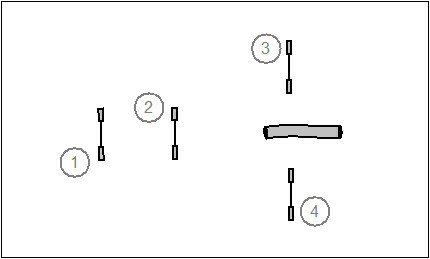 A pull-through is a sequence that requires the handler to draw the dog past two perfectly good obstacle choices to the performance of an obstacle through the gap. 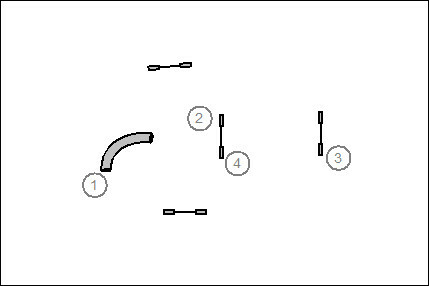 This sequence features two pull-throughs. The first is from jump #2 to the “hidden” entry to the pipe tunnel. The second is the transition from jump #4 to jump #5. This second pull-through is a threadle, which is by definition a pull-through in which the jump just taken becomes a wrong course option. Design Notes: Between jump #2 and the wrong course A-frame, the course designer must allow a minimum of 12′ for the handler to work his magic. In the transition from jump #4 to #5 the gap between jumps must be generous enough for both the dog and the handler to move through. A back-side can first of all be defined as an obstacle approach that is hidden to the dog and must be managed by the hander on the flat. This is an illustration of a hard backside, meaning that the wrong side of the obstacle is presented to the dog as a logical choice, though it is a wrong course option. Design Notes: A minimum of 12′ must be left to the handler after jump #2 to avoid the wrong course option. A soft backside is a managed approach that does not explicitly present a wrong course option to the target obstacle. By definition a 270° turn is a soft backside. The backside is not limited to jumping sequences. You’ll recognize that this is a hard backside. A cluster is an arrangement of obstacles with multiple entries and multiple exits. The classic Hobday Box is surely a cluster. A cluster is an arrangement of obstacles with multiple entries and multiple exits. 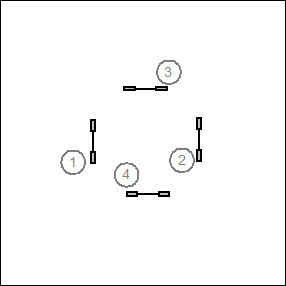 A dog entering the cluster faces multiple options to exit. Aside from offering a variety of wicked challenge possibilities, the cluster allows a lot of action in a small space. Design Notes: For the cluster to do its work to enhance sequencing possibilities in a small space, all of the obstacles in a cluster should not be used up in a single pass. If you think about it, the dog should be able to move through the cluster two or three times without much reuse of obstacles. And so for a fixed footprint, the course designer can raise the obstacle count and reuse fewer obstacles. An En Passant is an arrangement of obstacles that requires the handler to move the dog around an obstacle on a curve to a hidden approach. 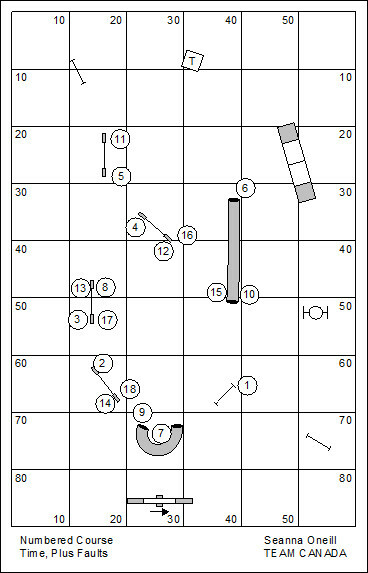 The en passant is an excellent example demonstrating that many of the International-Style challenges create unusually long transitional distances between obstacles. This is expected and acceptable. The long transitions give balance to the arduous technical bits and micro-management. The real difficulty with the International-Style Challenges in any venue is the degradation of the dog’s working speed to solve challenges which call for some degree of micro-management. It is truly an art form to create a course that flows and for the most part allows the dog to work at his top speed while presenting the dog and handler with wicked technical challenges along the way. Avoid any course design with relentless technical demands. A Superior/Masters level course should feature no more than two or three such challenges. 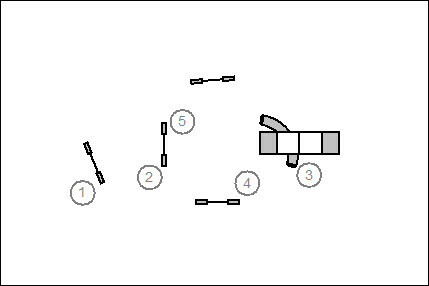 Outside of these the course designer should endeavor to build speed and allow the dog to mostly work with an open stride. Truckin’ Like the Do-Dah Man! The June league course for the National Dog Agility League was designed by Seanna O’Neill of Team Canada. It’s a small slip of a numbered sequence that fits in a 40′ by 60′ space. For our own training, I’ve incorporated her league courses in a larger set of the floor partly to demonstrate how it’s done; and more importantly because we have class tomorrow and we need a bit more than is provided by the league set. This is a pretty wicked riddle, eh? Calculated, I think, to give Sharon Nelson a heart attack (should she actually be paying attention). Posted in Games and Courses, National Dog Agility League | Comments Off on Truckin’ Like the Do-Dah Man! You are currently browsing the Bud Houston's Blog blog archives for June, 2015.